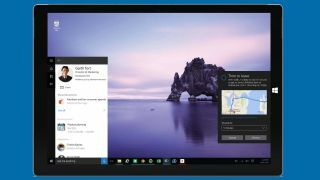 Cortana takes a bigger presence in the latest Insider Preview Build 10158 of Windows 10, especially for Office 365 users. Microsoft announced that the Halo-inspired digital voice assistant can deliver alerts for flight information, commuter traffic and package deliveries on the desktop, and Office 365 users can now get a glimpse of their schedule with deeper Cortana integration. "By integrating with Office 365, Cortana can proactively help you prepare for an upcoming meeting," Microsoft said in a statement. "Cortana brings you helpful information about the people you're meeting with, recent documents they've worked on, and reminders about when and where you need to be next so you won't be late." Screenshots posted by Microsoft show that Cortana can complement your schedule with glanceable information, like the weather forecast. On Windows 10 Mobile, the screenshot also shows actionable buttons for an appointment entry so you can notify meeting participants if you're running late, or open Skype if it's a virtual meeting. Mobile integration will occur later this year, but desktop and tablet integration is available now. In another example, Microsoft shows flight information with a flight tracker to notify if your plane is on time. In the same view, Cortana also delivers traffic information to help you get to the airport on time for your flight. Microsoft isn't the first to roll out proactive or predictive notifications. Rival Google offers similar alerts on its Google Now platform, but Google doesn't have deep integration with Google Apps. "Through Office 365, Cortana can pull together insights to help you be more connected – like how you and your colleagues are connected to each other, documents you share and your upcoming meetings with them," Microsoft said. "Cortana will even deliver reminders when that important person contacts you." Microsoft did not specify where it is gathering the insights to make Cortana more useful for work, but Microsoft demoed various work-related features using data from the Power BI platform at the Ignite conference. "This lets you ask questions like 'which projects are due to be finished by July?' or 'which countries are my best customers in?' or 'how many PCs do my customers have by industry?' – which sound like the questions you can already ask Cortana, just with a knowledge base about your business rather than more general web searches," we reported in May. To get Cortana integration, you must be part of the Windows Insider program running the latest preview build, have an Office 365 account from work and be part of an organization that supports Cortana through the First Release program. For organizations that do not want Cortana integration at this time, Microsoft allows IT administrators to opt out of Cortana connectivity in the Office 365 Admin portal. In addition to delivering your daily schedule, Cortana could be used to send emails with your voice. With dictation, you can tell Cortana the email recipient and compose the message with your voice. It's unclear if Cortana's integration with Office 365 is the same personal assistant project that Bill Gates confirmed he is working on. Microsoft is also said to be involved with a Work Assistant app. Windows 10 will be available on July 29 for customers to download. Microsoft offers Windows 10 as a free upgrade during the first year of release for Windows 7, 8 and 8.1 owners. For ineligible customers, Windows 10 Home costs $129 (£99.99, €135) and Windows 10 Pro will retail for $199. Microsoft has not revealed international pricing for Windows 10 Pro. Cortana will be one of the highlight features of the operating system, allowing users to search the web, find local files on their systems or network and receive notifications and alerts. Other new features included in Windows 10 include the return of the Start menu, new multitasking capabilities, the Microsoft Edge browser and Continuum for users who work with convertible notebooks. In addition to Windows 10 availability, Microsoft has hinted that Cortana could make the leap to competing iOS and Android operating systems.